Check out some of our favorite stories from Christopher’s Game of Thrones tour with Liam Cunningham! He ran into Liam at breakfast at the hotel that morning, and Liam recognized Christopher first! He said "Well done!" and they chatted for a few minutes. When visiting Carnlough Harbor (most famous for the scene where Arya gets stabbed in Braavos), Liam bought lobster from some local fisherman and took it home for dinner that night. The most memorable part? Walking through the Cushendun Caves and hearing behind-the-scenes stories, like how Liam had to help Melisandre out of the boat since her cloak was so heavy. How can I not be excited? I got to see so many cool places, meet Liam, and talk about the show and his charity work." Meet Christopher: biochemistry professor, recreational runner, Game of Thrones fan. 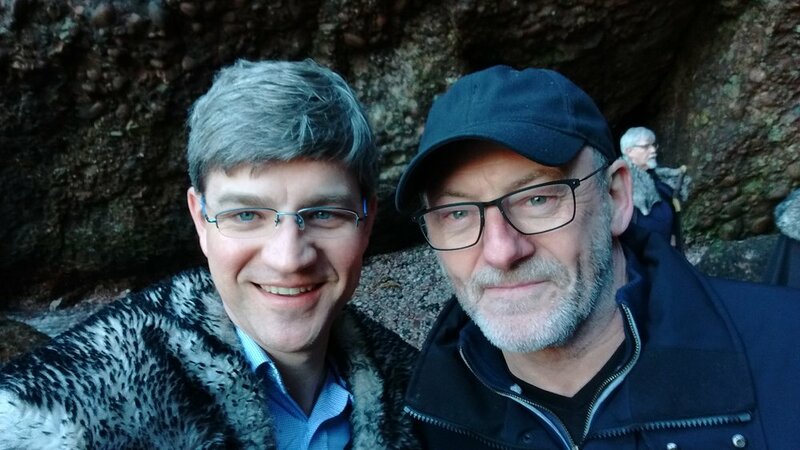 He got to hang out in Northern Ireland with Liam Cunningham, aka Davos Seaworth! World Vision is a global relief, development and advocacy organization that partners with children and families so they can reach their full potential. Their work brings lasting change to the lives of the world’s most vulnerable children by providing clean water, training on disease prevention and proper nutrition, assistance to disaster survivors and refugees, and more. Your donation will help tackle the causes of poverty and injustice, creating impact for communities in need in more than 50 countries.